As the largest city in the United States, New York faces serious threats on a daily basis. Join us Thursday, May 1 to speak with the man charged with protecting our city, New York Police Commissioner William J. Bratton. From the controversial Stop and Frisk, to terrorist scares, the head of the NYPD will offer us his expert insight on the state of our city—and its safety. Please join The Common Good for a riveting discussion open exclusively to our members as part of our ongoing Leadership Series on Thursday, May 1. William J. Bratton has been appointed the 42nd police commissioner of the City of New York by Mayor Bill de Blasio, the second time he has held the post. 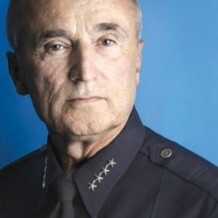 Commissioner Bratton established an international reputation for re-engineering police departments and fighting crime in the 1990s. As Chief of the New York City Transit Police, Boston Police Commissioner, and in his first term as New York City Police Commissioner, he revitalized morale and cut crime in all three posts, achieving the largest crime declines in New York City’s history. At the NYPD in 1994 and 1995, he led the development of Compstat, the internationally acclaimed command accountability system now in use by police departments nationwide. As Los Angeles Police Chief from 2002 to 2009 and in a city known for its entrenched gang culture and youth violence, he brought crime to historically low levels, greatly improved race relations, and reached out to young people with a range of innovative police programs. He is the only person ever to lead the police agencies of the nation’s two largest cities. A U.S. Army veteran of the Vietnam War, Commissioner Bratton began his career in 1970 as a beat cop in the Boston Police Department (BPD), where he was cited with the department’s top award for valor in 1976 for facing down a bank robber and rescuing a hostage. By 1980 he had risen to Superintendent of Police, the BPD’s highest sworn position. He went on to lead progressive change as chief or commissioner of five other police departments. A noted author, commentator, and consultant, Commissioner Bratton holds a Bachelor’s degree from Boston State College and is a graduate of the FBI National Executive Institute. At Harvard University’s Kennedy School of Government, he was a Senior Executive Fellow in Criminal Justice and a member of the school’s National Executive Session on Policing. For his collaborative efforts in working with U.S. and British police forces, he was recognized by Her Majesty Queen Elizabeth II with the honorary title Commander of the Most Excellent Order of the British Empire (CBE). Commissioner Bratton is married to attorney Rikki Klieman and is the proud father of David and grandfather of his son David’s two children, John and Nicolas.